Paella ciega at T’ahpas 529 in Melrose. Venezuelan-born Lorenzo Tenreiro and his wife, Emily, a Cape Cod native, opened T’ahpas 529 in January, four years after they launched neighboring Latin American spot La Qchara. Both restaurant names are misspelled, says Tenreiro, just to be different. His connection to Spain is through his father’s family; as a boy, when his father taught in Spain briefly, says the restaurateur, he loved the culture, the social life, and the sharing. Tapas here range from little nibbles of paprika and oregano-dusted Marcona almonds ($5) to platters of acorn-fed Iberico de Bellota ham ($25). You’ll find classics such as patatas bravas ($7), chunks of crusty potatoes with a sprinkle of spicy paprika aioli. 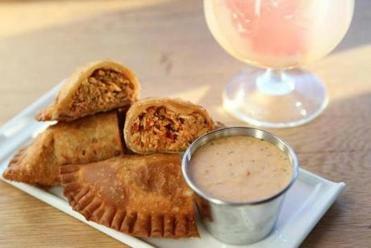 Crispy empanadas ($8), fried turnovers of flaky dough, are filled to brimming with savory shredded chicken, served with chipotle aioli. 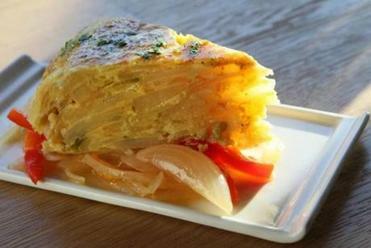 Tortilla espanola ($7), the layered egg pie, is golden on the outside, creamy in the layers. It sits on sauteed onions and bell peppers. Ubiquitous pan con tomate ($5), which every cafe in Spain serves, isn’t quite right. Instead of smearing bread with tomato pulp, here the tomato flesh has been pureed, which turns it pink and runny on the toast. Tortilla espanola at T’ahpas 529. Garlicky shrimp ($11), hot with chile pepper, come perfectly sauteed into pink curls. Delicious fried artichokes ($10) aren’t crisp, but that doesn’t matter because they’re so appealing with Parmesan cream. Lots of dishes get a drizzle treatment with something creamy or creamy/spicy. Fried calamari ($11) are overcome with yet another drizzle, honey, mango, sesame, and cashews. Then an unadorned dish of sliced chorizo ($8) turns out to have surprisingly little taste, and octopus ($10), also thinly sliced, and served without its tentacles, has little flavor. These could be a big hunk of juicy sausage and pieces of octopus that look like they came from the sea. Chicken empanada at T’ahpas 529. Main courses serve three or four. You have to order paella at the beginning of the meal because it takes half an hour. 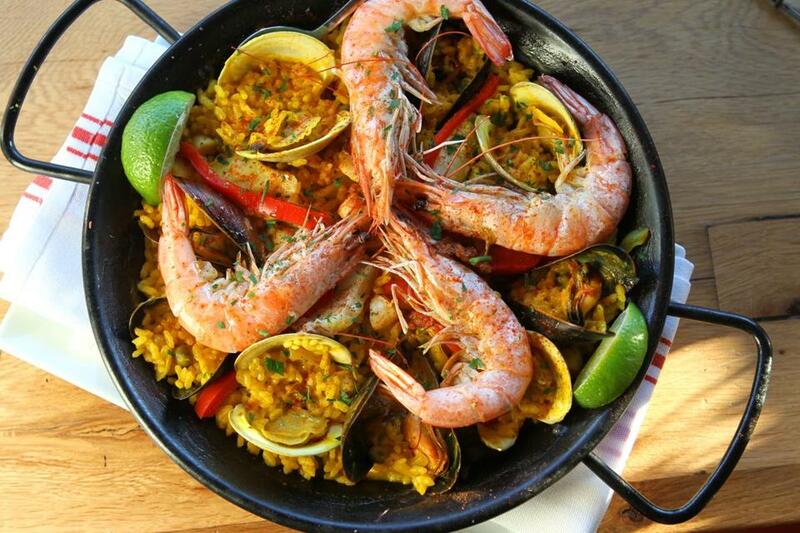 A pan of traditional paella ciega ($30) is abundant with head-on shrimp, clams, mussels, and scallops, and this dish has lovely, familiar flavors, but it lacks the crunch of rice the Spanish call socarrat, the golden, caramelized grains stuck to the bottom of the pan. A multilayered chocolate cake ($6) is too cold at first, but wonderful when it warms up. Orange-flavored flan ($6) is exceptionally creamy, except it should lose its strawberry garnish. The Tenreiros have a flair for doing things differently, but this doesn’t always work with food. Sometimes a more traditional approach is the best way. 529 Franklin St., Melrose, 781-590-4916. All major credit cards. Wheelchair accessible. Prices Tapas $5-$25 (most under $12). Entrees $27-$35 (serve 3-4). Desserts $6-$12. Hours Mon-Wed 4-10 p.m., Thu-Sat 4-11 p.m., Sun 4-9 p.m.
What to order Chicken empanada, patatas bravas, tortilla espanola, artichokes, shrimp, paella ciega.